Last summer I had the opportunity to travel across Canada to Halifax, Nova Scotia for work. I’d only been out east once in my life and it was many years ago so I was very exited to get back and explore. 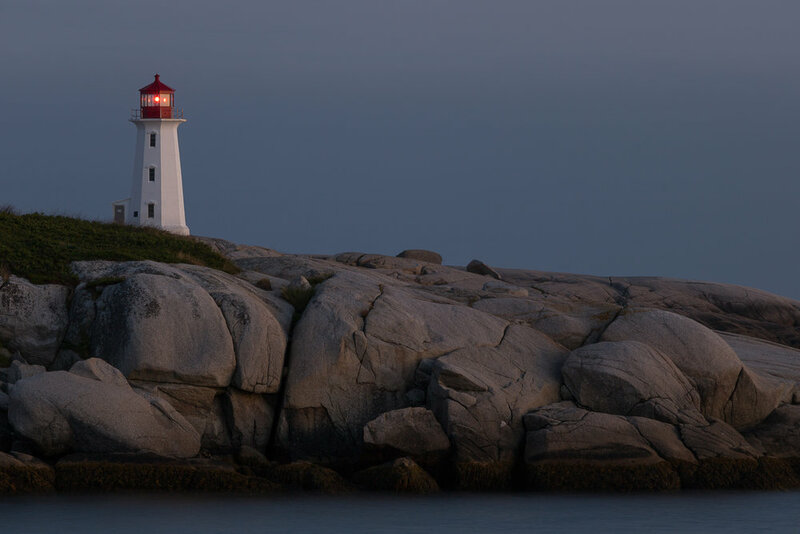 I knew I wanted to catch sunset at Peggy’s Cove on the first day so I booked the earliest flight possible leaving at 6am. The flights from Vancouver to Halifax are eight hours plus a four hour time change. This means if I left at 6am i’d get in around 6pm. Sunset at Peggy’s Cove was at 7:30pm and it was an hour drive from the airport to Peggy’s Cove. This was cutting it really close and I unfortunately by the time I got there the sun had already set. I made the most of what I had and relaxed on the rocks, listened to the ocean, and captures some night long exposures. I decided I’d come back for sunset the next day and I’m glad I did. 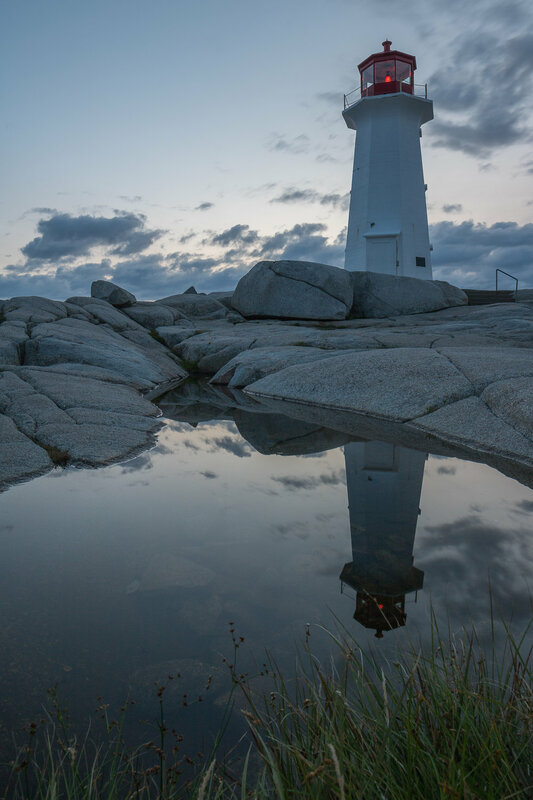 There are a ton on angles to shoot Peggy’s Cove Lighthouse but these are some that I found worked well. I used a 10 stop hard grad ND filter on every sunset shot to slow my shutter speed and help eliminate the hundreds of tourists walking around the rocks! The rest of the tourists in my shots I managed to edited out in Photoshop. Here are some of my favorite shots. While I was waiting for the sun to set I had the idea of lining up the sun perfectly so that it was as if it was the light from the lighthouse. I walked along the rocks to line it up perfectly and snapped this picture. I used a higher f/stop in order get that sun star and again, used an ND filter to help eliminate the people. Keep your eyes peeled for puddles of water trapped in the rocks. These make for great reflections if you can get close enough to the ground and have a wide enough lens. You can utilized the walking path as a leading line towards the lighthouse. When you turn onto the main road down to the lighthouse there is a parking lot immediately off to the right. I decided to check it out on my way back to Halifax. There are multiple paths down from the parking lot into a grass land. From here you can see the lighthouse from a distance. Make sure you bring bug spray since there are a ton of mosquitos in the grass!